Today is World Voice Day! Occurring annually on April 16, World Voice Day is a great time to spread the word about the marvel of the human voice and the importance of taking care of it. Events held in celebration of the day include concerts, performances, educational workshops and vocal screenings. Why limit this event to just one day? As a speech-language pathologists, we can take advantage of this event to raise awareness and help prevent vocal disorders in a highly at-risk group—classroom teachers. Classroom teachers use their voices an average of 49 hours per week to perform their jobs. 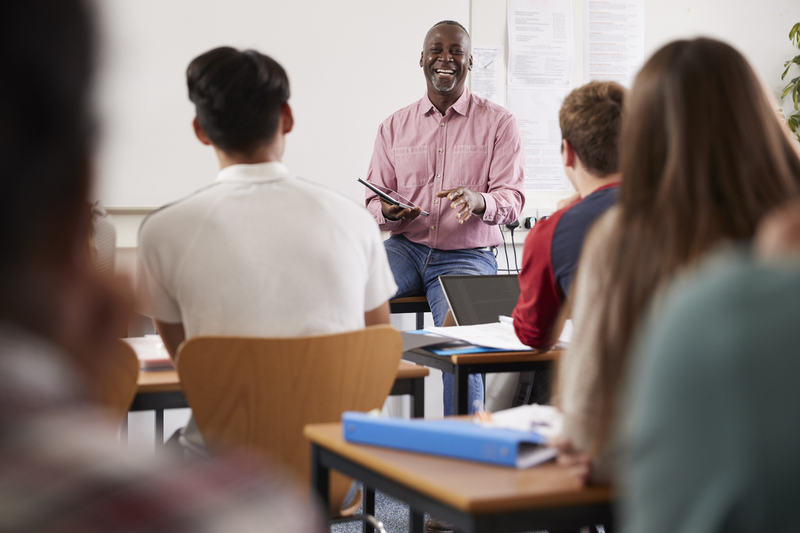 Add poor room acoustics and environmental pollutants found in many classrooms, and it’s no surprise dysphonia occurs two to three times more frequently in teachers than in the general population. In fact, voice disorders are considered the primary occupational risk for teachers. However, as many as 93 percent report never having guidance or training to prevent vocal problems. Take a look at whether or not science backs up these six common voice care recommendations. What do you need to know about vocal fry? SLPs and a linguist weigh in on cultural influence and clinical intervention. Juggling two full-time careers sounds exhausting, but SLP and soul-jazz vocalist Rhonda Thomas finds using her voice in these two different ways vastly rewarding. Let’s change these statistics by implementing prevention programs in schools around the country. SLPs play a pivotal role in prevention as well as treatment programs, so we can make a significant difference by actively helping our teachers learn ways to care for this crucial teaching tool. Offer to provide an in-service. You might think it’s too late in the year for this, but many teachers start to experience vocal overload at this point and probably welcome any relief. If you don’t have time for an in-service session, how about sharing tips on social media? Ask for space on the school website or e-newsletter to provide tips, fun quizzes and challenges for all faculty on maintaining their vocal health. In addition to vocal hygiene advice—drinking water, resting the voice—include information on laryngeal anatomy, physiology and geography. Understanding the interaction of the larynx in respiration and swallowing, for example, illustrates how reflux, heavy lifting, consumption of excessive caffeine and other behaviors can affect vocal health. Consider providing a vocal “boot camp” to teach techniques to maximize vocal quality: modification of respiratory support, onset of phonation and use of resonance. Host a couple of after-school sessions and tailor activities to fit the needs of the various teachers—for example, offer separate short group sessions to help coaches or kindergarten teachers improve their vocal techniques. Provide suggestions for improving the auditory environment of the classroom so teachers can avoid raising their voices. Educational audiologists can help evaluate classroom acoustics and give modification ideas. Encourage teachers to incorporate “vocal naps” into their daily schedules. As little as 10 minutes of vocal rest and rehydration can minimize effects from prolonged vocal usage. Suggest teachers swap out various high-demand vocal activities such as playground, lunch or bus duties to minimize excess wear on their voices. Offer annual vocal screenings. A vocal checkup will help identify potential problems and prevent possible escalation of issues. Encourage teachers to implement vocal hygiene programs for their students as well. This gets everyone on board with maintaining a healthy voice, both at school and at home. Check out available resources and share some of them with your colleagues: University of Iowa’s Voice Academy provides information and suggestions specifically for teachers on ways to prevent vocal problems. ASHA offers a Practice Portal and Evidence Maps on voice disorders. Or join ASHA Special Interest Group 3, Voice and Voice Disorders, to read Perspectives articles and ask voice-related questions of other SLPs on the community boards. We can show our support and appreciation for classroom teachers and other educators by helping them protect and preserve one of their most valuable teaching tools. Contributing author, Allison Wegman, MS, CCC-SLP, is a clinical assistant professor at in the Department of Audiology and Speech Pathology at the University of Tennessee Health Science Center.